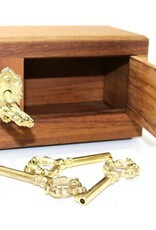 The performer displays a beautiful wooden box and four keys, only one of which locks and unlocks the box. A large wad of bills is now placed inside the box which is then securely locked by a member of the audience. The key that locks the box along with the other three are now dropped into a clear glass and mixed thoroughly so that no one knows which key opens the box. Three spectators now each freely select a key, leaving one in the glass for the performer. Whoever holds the key that opens the box keeps all of the cash inside. The spectators may also exchange back and forth with the remaining key in the glass as often as they wish. Needless to say, the performer’s key is the only one that opens the box! The nice thing about this is that it can be done entirely without the performer as much as touching the keys and he, himself, never needs to try to open the box! 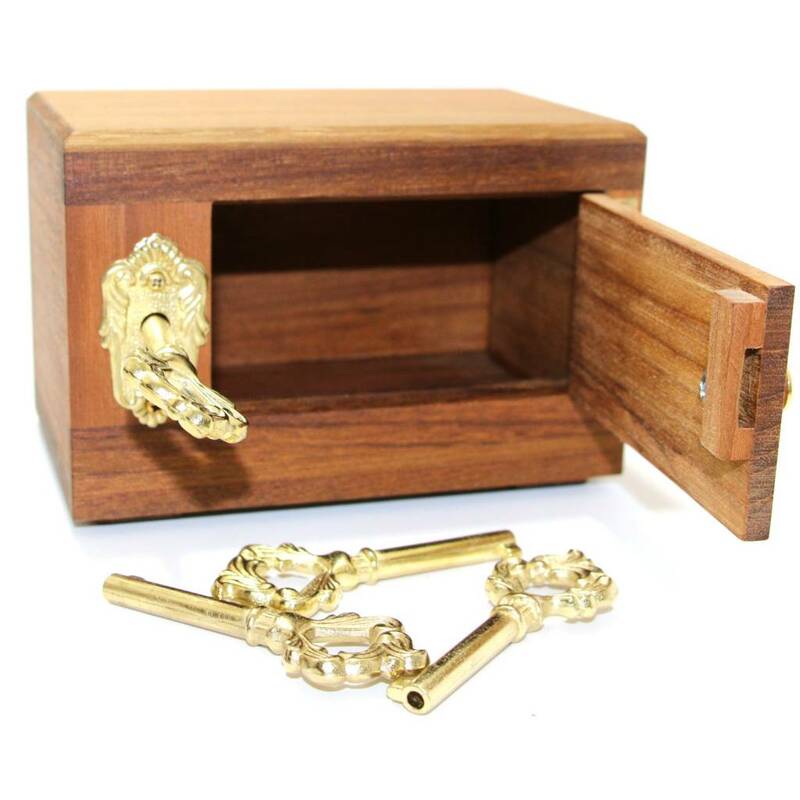 Obviously, this opens possibilities for a lot of entertainment as the performer can also place a borrowed ring into the box and have the keys chosen by the spectators and only the owner of the ring can open the box. • The effect can be performed in full view and the box never leaves the sight of the spectators, not even for an instant! • The effect can be immediately repeated with no force or elimination of any kind! • The effect is entirely self-contained and mechanically ingenious! This effect has been inspired by the very rare “Anverdi Key Box” effect, however; with this version, there are no electronics or outside gimmicks used in any way! The box measures approximately 14.5cms wide, 9.5cms high and 9.5cms deep and has been completely handcrafted from natural aged teak wood with a lightly distressed oil finish.